Is OPEX your friend in IT? It’s funny to have the OPEX and CAPEX conversation with fellow technology geeks and sales people. Everyone says OPEX is better, and tells the CFO and CIO that today’s solution is going to save you from CAPEX! I think most decision makers are getting tired of hearing that. So much –it’s almost dismissed as sales buzz words. Probably because many consultants forget the deeper significance (AND when there are exceptions to the rule). What happens when you ask the geek and sales guy the significance of the two? What is the difference between CAPEX and OPEX? Congrats to my buddy Ed Saipetch (fellow Indianapolis Cloud, Storage, and Virtualization contributor (http://breathingdata.com/) ). Here is a GREAT video he and some of his team created for the VMWorld 2010 conference this year. Listen close and you just may pick up a few deatial of the value of virtualization AND Cloud related IT services. Enjoy! Below are the details to a LIVE webcast with the internal IT Operations team at VMware corperate. A lot of companies boast about how their backup product works for VMware, but what solution does the VMware team actually use internally for their own company data & VMware farm? Wednesday, August 19, 10:00 a.m. PST / 1:00 p.m. EST / 5:00 p.m. GMT - everyone encouraged to ask questions of the guest speakers during the live Q&A session. VMware Inc.’s first EMC Avamar deployment was in their Corporate IT datacenter, where Avamar solved their backup and recovery performance challenges, reduced reliance on tape, and enabled consolidation of their distributed remote office backup environment. The Avamar solution also provided secure offsite replication for disaster recovery. Corporate IT has since standardized on Avamar to protect their entire VMware environment with fast, daily full backups for approximately 400 Linux and Windows virtual machines. VMware Corporate IT relies on Avamar to protect terabytes of critical data, including file servers, SQL and Oracle databases, and customer-facing web applications. VMware Inc. leverages several Avamar solutions to best meet their needs, including Avamar agents in each VM Guest, Avamar Data Store, and Avamar Virtual Edition virtual appliances. Register for a complete list of US and international dial-in numbers and call instructions. Setting the stage and expectations of iSCSI. A lot of conversations on this topic seem to arise when talking about data center architecture. Most of my brethren in the enterprise, never dip their toes into these waters, because of legacy architecture standards, fabric technology investments, and team skills. A lot of people would go as far to say that Fibre Channel is actually easier to use. Nonetheless, in the commercial sector where 80% of the business market exists, iSCSI many times is the way to go. Especially when throughput does not dictate more than real world iSCSI capabilities… and when your data center communication backbone is TCP/IP… and the team skills are primarily TCP/IP. Then iSCSI is arguably easier to use. Real World statistics… iSCSI’s best use is when throughput is below (<60MBps). While higher performance is possible with iSCSI, the increased cost (iSCSI HBAs) and complexity (dependence on load balancing) offsets the normal iSCSI “simplicity/cost” benefits, at least with today’s Gigabit Ethernet. Generally speaking, many servers are usually below this 60MBps limit and are good candidates for iSCSI connectivity. The best way to find out are by collecting statistics through IOSTAT, Perfmon, or other built in tools that measure the OS and the applications. Email me to find out the mathmatic formulas to crunch the numbers. The net of this if course is, make sure your architect or consultant is recommending iSCSI when it is appropriate for you. Not just because it is the only protocol his or her storage can leverage. That’s like me going to ask a Ford dealer if he has any Chevy autos on the lot for sale. What do you think he will say? With that being said… here are the nuts and bolts behind iSCSI best practices. Top 3 best practices. One of my resources at EMC, and friend, Chad Sakac, posted a great article on using iSCSI on VMware, and how it works. This is a technical write up, and be really good to forward onto anyone who you know is a VMware or SAN storage engineer. There are of course many advantages to using just about any connection type (FC, IP/NFS, or iSCSI) and my company offers all. This is a unique opportunity to hear what all the major vendors are saying on iSCSI on a joint effort. From Chad's introduction... "Today’s post is one you don’t often find in the blogosphere, see today’s post is a collaborative effort initiated by me, Chad Sakac (EMC), which includes contributions from Andy Banta (VMware), Vaughn Stewart (NetApp), Eric Schott (Dell/EqualLogic), and Adam Carter (HP/Lefthand), David Black (EMC) and various other folks at each of the companies. Together, our companies make up the large majority of the iSCSI market, all make great iSCSI targets, and we (as individuals and companies) all want our customers to have iSCSI success." If there was one aspect of your life that you could virtualize, what would it be? 2> To have the ability to vMotion yourself from one country to another? 3> The ability to snapshot conversations you have with your wife? That way when you say something stupid, you roll it back, wipe out what you said, and pretend it never happened. Way too funny! These are three opening quotes from this "Future of Virtualization" clip. Basically, after that opening – I was hooked. What follows is about 3 minutes of what customers are asking virtualization to do in their business... what are the future things you would ask for? With the release of ESXi recently, you no longer need local storage for your ESX servers. By putting the ESXi code on a bootable USB Thumbdrive, you can easily turn your PC or Laptop into an ESXi server and learn ESX without having to dedicate any hardware. This enables you to create an ESX lab at home without any server hardware. If you repeat the process below for 2 different servers, you can actually create an ESX cluster and use many of the advanced features in VI3.5. This document will show you how to setup an ESXi server using a bootable USB Thumbdrive with both iSCSI and NFS storage from a Celerra Simulator (if you are an EMC customer, you can download the Celerra (as a VMready appliance, from www.powerlink.com) and have "virtual storage" that is fully functional & great to learn about storage, how it works, and even for test and dev)). If you are not a customer, just email me, and I will send you a link. The only hardware needed for this process is a 512MB USB Thumbdrive, your laptop, and the temporary use of a home PC/laptop. This is a first draft of a document created by one of my engineers, while configuring ESXi at home, so feedback is appreciated as people try to duplicate the steps. Some other Docs I have, setting up the virtual Celerra for example, are one's that I have been slowly modifying over the last year. please view the comments section for new instructions on downloading the virtual SAN appliance & videos of how to do it. Also, you can use these two guides (below) as a supliment to the videos in the comments section. There may be a few typos on these docs, but they were the best I could come up with, on a limited time crunch. Again, I would just go to my links saved in the comments section of this blog post, to watch the video(s). We've all been waiting for it.... if we could not attend. What happened at VMware World? It's important for people local to Illinois to understand the press releases because out of approx 10K + attendees Illinois only sent a little over 300 people. Indiana too, becasue there were only ~100. If those attendees did not bring back sufficient information to see into the future OR if we do not watch the wave, we get left behind. Not only in keeping an organized approach to being wise stewards of our organization's data centers -but also on saving and making money with our organizational data for true information lifecycle management. 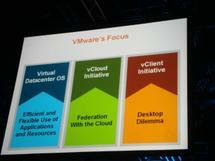 Feedback from attending colleagues of mine surrounded mostly around VMware’s focus on product announcements centered around "best blend of distributed and consolidated computing" as opposed to “infrastructure.” I summarized about 6 of 14 overall announcements from VMware World by VMware. And 3 from EMC that are related to VMware’s as a group, in my next post. It’s easy to see this word choice throughout each of their press releases. VMware wants you to understand they are not infrastructure specialists (although very good as a utilitarian use for solving those issues), but rather an enabler of IT in business to become an internal (or external) service provider via a consolidation and flexibility approach to managing IT. This is very good. It's their way to do what customers are asking for. Al lot of products were renamed, classified, and some products announced in new and public ways. Cisco and Vmware Join MSFT's Server Virtualization Validation Program. Congratulations Cisco, VMware & others on MSFT’s support of your virtualization platform! See the Server Virtualization Validation Program. I remember a lot of conversations on this topic in the past. I am so proud of my colleagues in the industry for helping create the eco-system of this market. There are so many thought leaders around the globe who see open systems virtualization as the next big innovation for computing. On scale with similar impact that the Internet has had for us all. From many angles including (but not limited to) green initiatives, business influence, and even skills and trade. I’ve been in countless conversations on this topic over the years. Several years ago, it was such a new concept for the datacenter (at least the open systems and network infrastructure divisions) to have complex economics. Today, I know that this is an evolving approach to the datacenter and can become very complicated. However, to the CIO and IT Director who exhibit thought leadership in their organization –this topic can define you and your influence in the business. I am limiting the conversation to virtualization in general and storage systems for the information which our business lives. It can and should be discussed in great detail across many practices in the datacenter. None of these thoughts are my own, and have evolved from my interactions over time with many other highly trained individuals. To realize economics and ROI on virtualizing the data center, and the storage where it resides, leadership must recognize and record costs and savings from the former generation of computing to the new. Manufacturing industries have been using components like shared and dedicated components for a long time… additionally fixed and variable costs have entered the stage. Take a look at Activity Based Costing for example. Harvard Business School (among many others) are known to teach this to their bright students. If we can allocate and recover the costs of the infrastructure and management of it, then we can see the ROI and properly justify the investment to the business. It’s my hope that more businesses adopt approaches like this, in order to align Business and IT… so investments are realized and costs are recovered easily on paper. 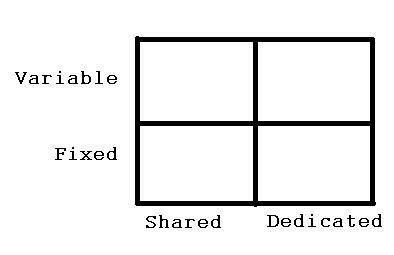 By using the Activity Based Costing model, let’s carve our environment into these four segments.